Dunlop HT1 Heil Talkbox - "Not many alternatives out there"
Dunlop HT1 Heil Talkbox - "Great device!" 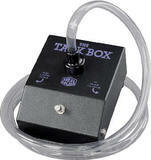 Dunlop HT1 Heil Talkbox - "Good talkbox but...."
Rocktron Banshee TalkBox - "Livin' on a....Banshee!" Danelectro Free Speech TalkBox - "Danelectro Free Speech Talk Box"
DigiTech Talker - " Underrated"
MXR M222 Talk Box - " Spectacular!" MXR M222 Talk Box - " Good but be careful problem"